Reading and share top 16 famous quotes and sayings about Trespassing by famous authors and people. 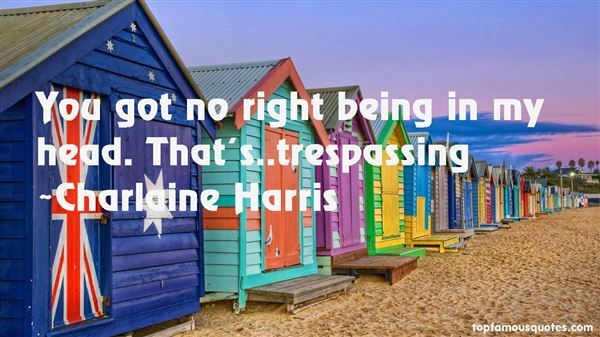 Browse top 16 famous quotes and sayings about Trespassing by most favorite authors. 1. "Bell seated himself behind the desk, motioning for Nancy to stand opposite him. There was tense silence for a moment. Then Bell reached for a desk telephone. "I am going to call the police, Miss Drew, and turn you over to them on a charge of trespassing, breaking, and entering with an attempt to steal. ""I wish you would," Nancy replied. "if it is possible over that dummy telephone." 2. "A daffodil bulb will divide and redivide endlessly. That's why, like the peony, it is one of the few flowers you can find around abandoned farmhouses, still blooming and increasing in numbers fifty years after the farmer and his wife have moved to heaven, or the other place, Boca Raton. If you dig up a clump when no one is nearby and there is no danger of being shot, you'll find that there are scores of little bulbs in each clump, the progeny of a dozen or so planted by the farmer's wife in 1942. If you take these home, separate them, and plant them in your own yard, within a couple of years, you'll have a hundred daffodils for the mere price of a trespassing fine or imprisonment or both. I had this adventure once, and I consider it one of the great cheap thrills of my gardening career. I am not advocating trespassing, especially on my property, but there is no law against having a shovel in the trunk of your car." 3. "You got no right being in my head. That's..trespassing"
4. "I stood still an hour or thereabouts without trespassing on our orders (for so long the caravan was in passing the gate), to look at it on every side, near and far off; I mean what was within my view: and the guide, who had been extolling it for the wonder of the world, was mighty eager to hear my opinion of it. I told him it was a most excellent thing to keep out the Tartars; which he happened not to understand as I meant it and so took it for a compliment; but the old pilot laughed! "Oh, Seignior Inglese," says he, "you speak in colours. ""In colours!" said I; "what do you mean by that? ""Why, you speak what looks white this way and black that way - gay one way and dull another. You tell him it is a good wall to keep out Tartars; you tell me by that it is good for nothing but to keep out Tartars. 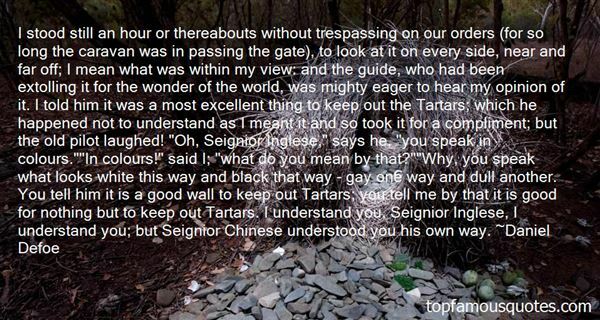 I understand you, Seignior Inglese, I understand you; but Seignior Chinese understood you his own way." 5. "If people persist in trespassing upon the grizzlies' territory, we must accept the fact that the grizzlies, from time to time, will harvest a few trespassers." 6. "We had just commenced the third course—the bread and jam—when a gentleman in shirt-sleeves and a short pipe came along, and wanted to know if we knew that we were trespassing. We said we hadn't given the matter sufficient consideration as yet to enable us to arrive at a definite conclusion on that point, but that, if he assured us on his word as a gentleman that we were trespassing, we would, without further hesitation, believe it." 7. "...delineated with signs reading:TOWN OF AMHERSTWATERSHEDNO TRESPASSINGWhich every boy in the neighborhood understood as:PRIVATE PRESERVE FOR KIDS"
8. "But any time you have a thought in your head about you that didn't come from the heart of God, you're trespassing against your own body." 9. "She headed for a wide flat rock on the creek's bank, her posture still demanding 'no trespassing' but no longer 'trespassers will be shot." 10. 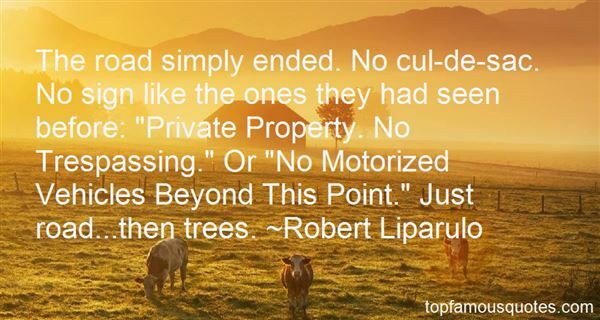 "The ownership of land is an odd thing when you come to think of it. How deep, after all, can it go? If a person owns a piece of land, does he own it all the way down, in ever narrowing dimensions, till it meets all other pieces at the center of the earth? Or does ownership consist only of a thin crust under which the friendly worms have never heard of trespassing?" 11. "The road simply ended. No cul-de-sac. No sign like the ones they had seen before: "Private Property. No Trespassing." Or "No Motorized Vehicles Beyond This Point." Just road...then trees." 12. "As an American, and especially as a Christian, I am convinced that a love for our own people is not a bad thing, but love doesn't stop at borders. Love is infinitely boundless and all about holy trespassing and offensive friendships." 13. "Rin: "You realize you two are trespassing, don't you? This place is my territory, get it? And anyone who comes into my territory without permission...has to pay a toll! "Akira: "Toll...? "Keisuke: "A...a girl?? "Rin: "Sorry to break it to you...but I'm packing! "Keisuke: "P-packing...? What? !@*?!!" 14. "Mr Flosky suddenly stopped: he found himself unintentionally trespassing within the limits of common sense." 15. "We've produced a generation of spiritual panhandlers, begging for coins of wisdom, banging like bums on every closed door...if an old man moves into a shack or a cave and lets his beard grow, people will flock from miles around just to read his "no trespassing" sign"
16. "As I went walking I saw a sign thereAnd on the sign it said "No Trespassing. "But on the other side it didn't say nothing,That side was made for you and me.This land is your land, this land is my landFrom California to the New York islandFrom the Redwood forest to the Gulf Stream watersThis land was made for you and me."